I like this photo for a few reasons. The sunlight behind the cholla thorns makes a nice halo effect. I shot it with my iPhone. And, it’s heavily cropped. The photo shown here is less than half of the total frame as shot. I had a small cholla in the foreground when I first composed the shot, but decided that I preferred the big one in the middle as the focus. Also, the foreground distracted from the background of the mountains. So there’s another reason for the crop. I’m amazed at how sharp this turned out from such a small camera. When people ask me why I bought the iPhone 6s Plus, I always answer, “because of the camera.” This is why. It’s really quite amazing, no? I was part of a group of 12 travel bloggers who were kindly hosted by Mazda and James and Heather Hills of Mantripping.com for three days of camping in Joshua Tree and driving around the southern desert of California in really nice Mazda cars. I shot this photo near the southern end of Joshua Tree National Park as I was on my way in my borrowed Mazda 6 to the Salton Sea area. 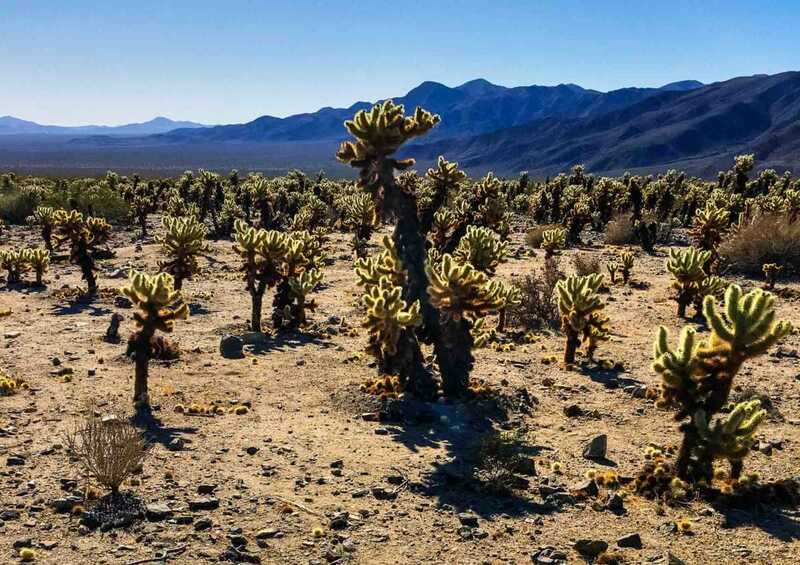 Don’t touch the cholla, no matter how pretty they are. The spines come off very easily and are quite an irritant. I know this from experience. Also, thanks to Hormel Foods (a Minnesota company, btw) for providing us with sausages, bacon, and, yes, Spam, to keep us well fed. And also to Napoleon Grills for giving us something to cook all that delicious meat. Also, check out this link for more bloggers’ perspectives on our desert #drivingmatters trip.